Sitges boasts gorgeous beaches, narrow lanes full of bars and restaurants, and a couple of fascinating museums. A huge favourite with the LGBTQ community, Sitges is also famous for its wild carnival and Pride celebrations. If you want a break from the coastal hubbub, head to the Garraf Nature Reserve located just inland: this stretch of rugged coast offers wonderful walking trails and panoramic views. All in all, this is an excellent destination for a cheap holiday. Sitges has no less than 17 fabulous beaches, which extend in both directions from the town centre. The busiest is the Platja de la Ribera, in the centre of town, which has plenty of facilities, including sun loungers, beach bars, and a lifeguard post. Behind it is a long promenade which is lined with bars, restaurants and shops, with more located in the tangle of narrow streets behind it. The town’s most prominent landmark is a very pretty Baroque church, which overlooks the sea. Nearby, the Maricel Museum and Cau Ferrat Museum showcase Catalan and Spanish art. The Port Aiguadolç is a yacht-filled marina surrounded by restaurants, bars and clubs. The nightlife, especially in summer, is legendary, and there is a huge array of clubs and beach bars to choose from. Sitges offers a huge choice of restaurants, most of which offer Mediterranean and Catalan cuisine, although you’ll find plenty of options serving Japanese, Indian, Chinese and Italian food too. Classic local dishes include the succulent seafood stew suquet, and a huge choice of Mediterranean rice dishes from paella to arròs negre (cooked with squid ink) or arròs a banda (cooked in fish stock). The local speciality in Sitges is xató, a salad or the For dessert, try mel i mató, curd cheese drizzled with honey, or crema catalana, which is similar to crème brûlée. There are lots of tapas places, where you can tuck into truita (Spanish omelette), xipirones (fried baby squid), and patates braves (chunks of fried potato with a spicy sauce). Sitges may not, at first glance, be an ideal destination for families, given its reputation for intense nightlife. 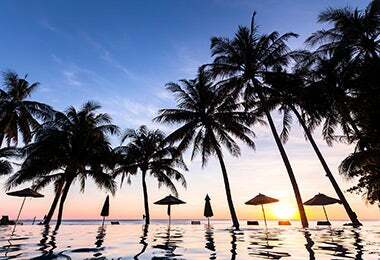 But its blissful beaches, compact size, and relaxed, beach town atmosphere make it ideal for a family holiday. There are no major sights, but kids will enjoy messing about on the beach, perhaps renting a pedalo or a kayak. You can head into the Garraf massif for picnics if you want a break from sun, sea and sand, or hop on the train to reach Barcelona, the Roman ruins of Tarragona or the PortAventura World theme park (one of Europe’s larges) – all are under an hour away. Sitges is a relatively small resort, and most of the action takes place along the beaches. There are scores of water sports available, mainly from the Port Aiguadolç marina. You can surf, paddle-surf, or rent a kayak to explore the coastline. The nearby beach of Garraf (a few minutes away by train) offers amenities for wind-surfing and kite-surfing. There’s a golf course with sea views, plenty of spas and places to indulge in some pampering, and the town also offers tennis courts. The Garraf hills located just inland, which are now a protected nature reserve, have several hiking and mountain-biking trails. The main town beaches are the adjoining Plata de la Fregata and Platja de la Ribera, and the Platja de Sant Sebastià, which are all right in the town centre. The Platja de la Ribera is the best equipped of them all, with pedaloes and kayaks to rent, along with sun loungers and parasols. There is also a beach by the marina at Port Aiguadolç which is fractionally less crowded. There is a cliff-top walk along the coast that will bring you to a series of small coves, many of which are nudist beaches: in summer, a couple of them also boast laid-back beach bars. Sitges is a famous for its nightlife, and is packed with bars and clubs. The nightlife is at its most intense in July and August, although the build-up to the summer season begins at Easter. In winter, most of the bigger bars and clubs close down. There are scores of bars all along the seafront, many with terraces which are prime people-watching locations, and plenty more in the centre of town. There are so many bars located on the Carrer Primer de Maig that it’s become known as ‘Sin Street’. Many of the LGBTQ bars and clubs are found on Carrer Sant Bonaventura and surrounding streets. There are several enormous nightclubs located on the outskirts of town, linked to the town centre with shuttle buses that run through the night. Sitges is a beautiful seaside town with gorgeous beaches and a charming old quarter. It’s a romantic place for a relaxing holiday with your partner. The main beaches can get crammed in the high season, but you can wander down to Platja de la Barra which is slightly less hectic and has, among other facilities, a massage service. In the evenings, you can enjoy an enjoyable stroll along the seafront promenade and then have a romantic dinner in one of the many charming restaurants. If you like nightlife, you’ll be spoilt for choice: from glitzy cocktail bars to rocking nightclubs, Sitges has got party hotspots covered. Sitges is full of charming, turn-of-the-20th century Modernista mansions. The two main museums in Sitges are located in a pair of seafront mansions: the Maricel Museum contains displays of Catalan and Spanish paintings dating back to the 10th-century, while Cau Ferrat contains an enchanting treasure trove of paintings, ceramics, sculpture and random paraphernalia such as ancient keys and doorknockers gathered together by the artist Santiago Rusiñol. The Sitges International Fantastic Film Festival is one of the most prestigious events dedicated to fantasy and horror films. The biggest event on the local calendar is Carnival, celebrated with parades, processions and fireworks. In May or early June, locals carpet the streets with artistic creations made with petals for the Corpus Christi Flower Festival.